Spring in Portola Hills is probably one of my favorite times of year. The weather is just perfect. Cooler mornings and evenings, keep the green on the hills. As well the sunsets this time of year are just beautiful. Of course one of the other aspects I like about spring is the real estate market starts to heat up after a couple of quiet months. However, in Portola Hills march was still pretty quiet, but so was the rest of South Orange County. Inventory overall is very low throughout the county. As you will note there was a significant up tick in the median sales price. It is always important to note the mix of homes sold during this time last year was a balanced mix of both condo's and single family residence. This March the mix was all single family residences. The lack of condo sales is a true indication of the low inventory. 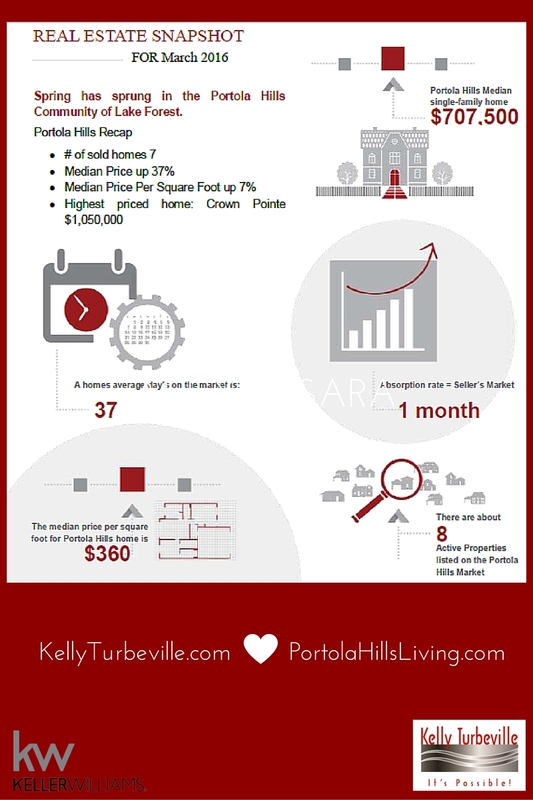 In Portola Hills the average condominium sells between $375,000 to $500,000. This is a critical price point for first time buyers. It as well spurs the move up buyers. It is an excellent time for condominium owners to take advantage of the low inventory and get top dollar for their home. There are some challenges condo homeowners need to be aware of in Portola Hills with FHA Financing but a professional Realtor should be able to help you understand this and find you the right buyer.. Please don't hesitate to contact Realtor Kelly Turbeville if you would like a deeper look at your homes value..